Glacier National Park in Montana, in my opinion of course, has the best mountain scenery amongst all the parks in the mainland United States. 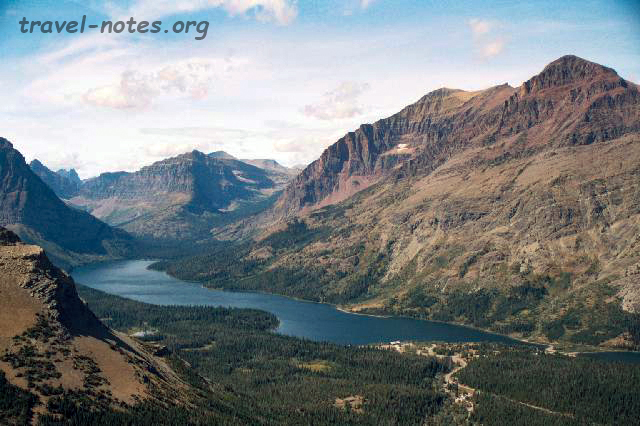 The park constitutes the US side of the Waterton-Glacier International Peace Park, one of the few national parks in the world which spans across two countries. This park is situated in northern Montana, on the extension of the Canadian Rockies into the United States. This park is also one of the few parks in the Unites States where one can actually see some wild life as opposed to reading about them at the ranger stations. My trip to the park was during the 2001 Labour Day weekend when the entire north-western region of the state was under the attack of one of the worst forest fires of the century. We flew into Missoula, which is situated 4.5 hrs from the park, late on the Friday night. Early next day we drove around the scenic Flathead Lake and reached the park by noon. We had enough time left in the day to drive along the famous Going to the Sun road which cuts across the park from east to west. This 52 mile long road is the only road inside the park and is supposed to be the most scenic 50 mile stretch in the US. But the views along the road certainly pale in comparison to the views along most of the trails in the park. The road, by the by, is named after a mountain, which, according to an old Indian legend, was used by the old man of the sun to come down to the earth to save the people from their troubles. 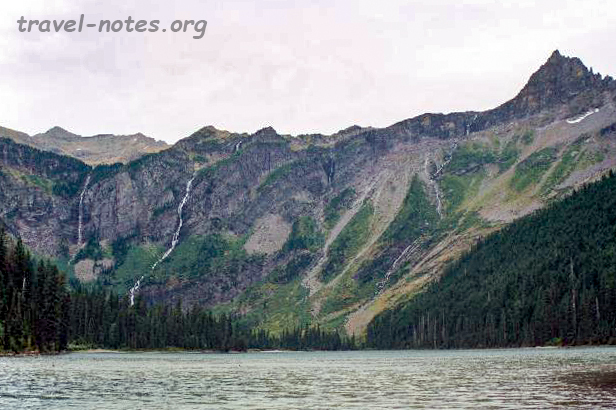 There are lot of short hikes available along the road and the best of which is the 2 mile hike to the Avalanche Lake The sight of 4 falls (7 during the wet season) flowing into the lake was one of the best we saw during our trip. Hidden Lake Trail (1.5 miles to the overlook and 3 miles to the actual lake) is another good short hike which starts from the road. 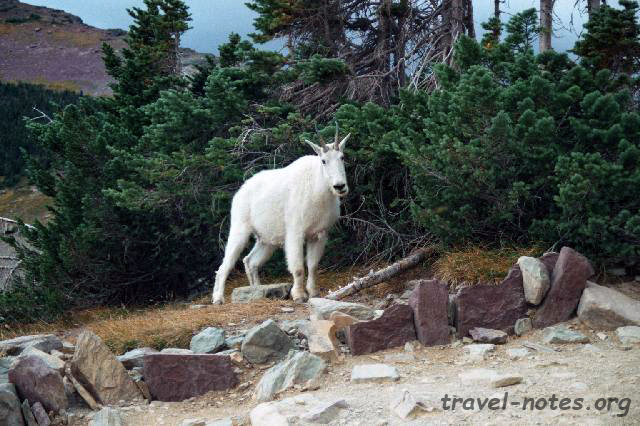 On all of these trails, you are certainly guaranteed to see mountain goats at close quarters and with some luck, a grizzly or a black bear - if you happened to be there at the right times of the day, that is. The highest point along the road is the Logan Pass, where it eventually crosses the Continental Divide. The other points of the interest along the road are the Lake McDonald, Saint Mary Lake, Sunrift Gorge and the Bird Woman falls. Our journey along the road lost much of its colour to the smoke from the forest fire which completely covered the park by late afternoon giving it a dull grey look and a strong burning odour. Luckily for us, there were strong winds in the mornings which kept the smoke away from the park long enough to for us to put one decent day hike every day. We spent a day each at the Two Medicine and the Many Glacier regions - the two regions in the park known for their day hikes. We took the 3 mile hike upto the scenic point at the Two Medicine region. The stunning views of the three lakes - upper, lower and the main Two Medicine lakes - combined with the 2500 ft elevation gain prevented us from coming down in time to catch the scenic boat ride across the lakes. But missing the ride gave us an opportunity to attempt the Grinnell Glacier hike early the following morning. 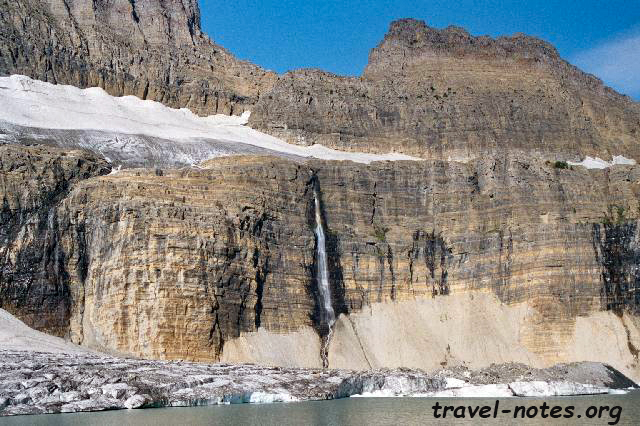 The Many Glacier region, also known as the little Switzerland of the US, is the home of some of the few remaining glaciers in the park. I was told that, thanks to the global warming, all the glaciers in the park would disappear by 2030. We started off at the crack of dawn on the final day on a 3 mile hike to the Grinnell Glacier, the most accessible glacier in the park. The hike was very beautiful and views along the way, especially those of the turquoise coloured Grinnell Lake, were spectacular. The glacier, situated at an elevation of 2000m, with its ice covered lake and pretty water falls, was certainly worth the effort. Despite starting so early, we were very disappointed not to have seen any bruins along the hike, although we did manage to catch a glimpse of a black bear on our way out of the park. The Glacier National Park may pale in comparison to its bigger cousins in the heart of Canadian Rockies, but is certainly one of the most beautiful in the US and also one of the best kept secrets of the country. 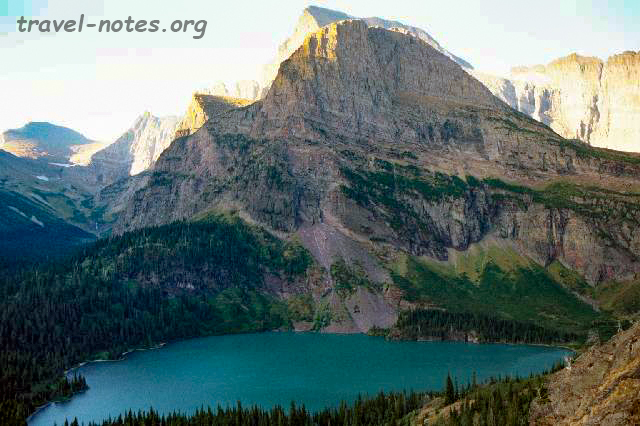 Click here for more photos from Glacier National Park.